Thousands of refugees are crossing the Canada-U.S. border, many fleeing escalated sociopolitical, white supremacist, misogynist violence and I.C.E raids in the U.S. In the first two months of this year, approximately 2000 refugee claims were filed at land ports of entry along the Canadian border. In Quebec alone there are six times more land-border refugee claims than in the same period last year.Â RCMP have intercepted or arrested (not yet charged) 1,134 refugees – nearly half as many asylum seekers in three months as all of the previous year. Hundreds have been forced to cross irregularly under dangerous and life-threatening circumstances. People who have contacted us and our networks are primarily from Somalia, Syria, Iraq, Turkey, Djibouti, Ghana, Nigeria, and Mexico. The Canadian government and corporate media’s rhetoric about ‘welcoming refugees’ is misleading. There are many discriminatory and unjust barriers, such as the Safe Third Country Agreement that the Canadian government refuses to rescind, and a difficult legal system for refugees to navigate if coming through the U.S. 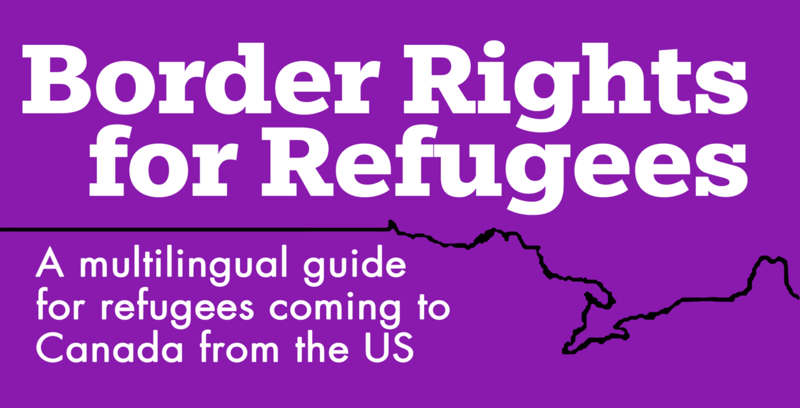 This guide is to better inform and support those making the difficult decision to cross yet another colonial border. 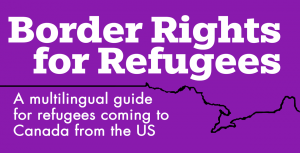 The guide is produced by No One Is Illegal and the Immigration Legal Committee of the Law Union of Ontario. Supported by the African-Canadian Legal Clinic. Freedom to stay, move, and return! In early January, Mohamed, a 16-year-old Syrian, arrived in Canada, alone. His parents had made a risky decision: They sent him to Canada in the hope of finding safety after learning that the country was accepting 25,000 Syrian refugees. A few weeks earlier, Prime Minister Justin Trudeau was at Torontoâ€™s main airport, personally greeting the first planeload of refugees. Mohamedâ€™s reception by Canadian officials was a little different: The Canada Border Services Agency immediately apprehended and delivered him to the Toronto Immigration Holding Centre, where he was placed in isolation for three weeks. February 18, 2016â€”Ottawa, ON â€“ All refugees and asylum claimants will soon benefit from full health-care coverage through a restored Interim Federal Health Program, the Minister of Immigration, Refugees and Citizenship, John McCallum, announced today. Starting April 1, 2016, the Interim Federal Health Program will provide health-care coverage for all eligible beneficiaries â€“ including basic, supplemental, and prescription drug coverage. Similar to provincial/territorial health-care insurance, the coverage will include hospital and physician services. Coverage for supplemental health-care services, such as vision and urgent dental care, and for prescription drugs, will be similar to what the provinces and territories provide to Canadians who receive social assistance. A Greek second-tier league match was delayed on Friday when players staged a sit-down protest against the death toll of migrants trying to reach the Aegean islands. The gesture of solidarity took place before the game between AEL Larissa and Acharnaikos in the Thessalian city of Larissa. As the match kicked off all 22 players plus coaches and substitutes sat in silence for two minutes in a show of respect to the hundreds of refugees who have lost their lives trying to escape conflict or persecution in countries such as Syria and Iraq. An announcement over the clubâ€™s PA system stated: â€œThe administration of AEL, the coaches and the players will observe two minutes of silence just after the start of the match in memory of the hundreds of children who continue to lose their lives every day in the Aegean due to the brutal indifference of the EU and Turkey. Syrian refugees have higher needs than originally expected, states a federal government report. More than half of those applying to be government assisted are children. About three-quarters speak no English or French. The refugees are resourceful and highly motivated to work to the point that they’ve risked arrest in Jordan. But only the men have experience and mostly in “low-skilled” jobs.